Here’s what happened. I was ready to dive into German with my 11- and 13-year-old daughters, who are homeschooled — but I can’t find our Rosetta Stone CD. The first disk in the set, I mean. It’s floating around the house somewhere. The rest of the program is right there in its slipcase on the shelf, nice and neat, but what good does that do my beginner-level kids? This fun vocabulary-building game manages to pack a lot of useful household words into five simple screens. The quirky, cartoony illustrations are lively and appealing. 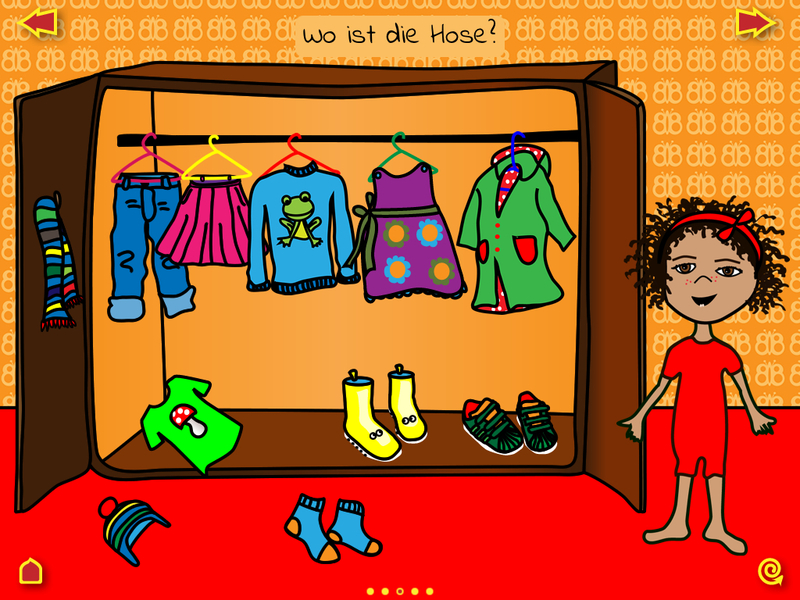 There are two levels of gameplay: in Level One, you touch objects in a room and their names pop up on screen, voiced aloud by a native German speaker. In Level 2, it’s your turn: the narrator names an object and you have to find it. My older kids mastered the vocabulary after just a couple of rounds of gameplay, so this is an app they’ll outgrow quickly. But it’s been a great starting point for learning the names of furniture and household items — bed, window, toothbruth, bathtub, shoes, jacket, spoon, bowl, etc. — and the goofy balloon celebration at the end of each level really cracks them up. And unlike many beginning vocab lessons, this app includes the definite article (der, die, das), which earns it extra points in my book. The verdict? Definitely worth our $1.99, but I wish there were more chapters. 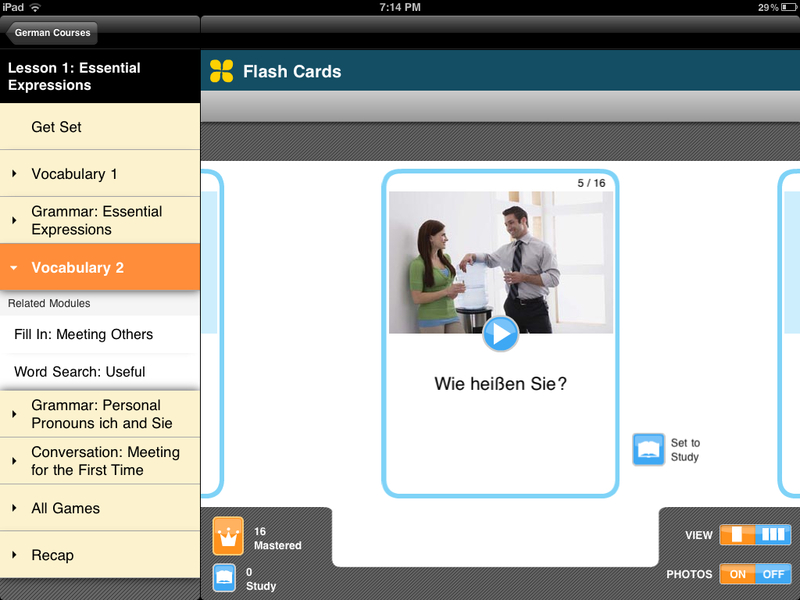 Image source: Baby Flash Cards screenshot. Note: this is a free app, which means there are ads appearing at the bottom of the screen. Despite the “Baby” in the name, this has proven an excellent choice for my 11- and 13-year-olds. (And right on down the line through my younger kids as well.) The concept is simple: four pictures are shown on the screen, and a native German speaker names one of them for you to click. This is a basic flashcard vocabulary drill, executed with finesse and visual appeal. I like the range of vocab in this app. Categories include: colors and shapes; numbers; alphabet (the format here is “A is for Äpfel” so you learn extra words along with the letter names); animals; and transportation. Downside: no definite articles. It isn’t “the apple,” it’s just “apple.” Which would be fine in English, but when you’re learning a language with masculine, feminine, and neuter nouns, it’s a good idea to get the correct article associated with the noun from the get-go. 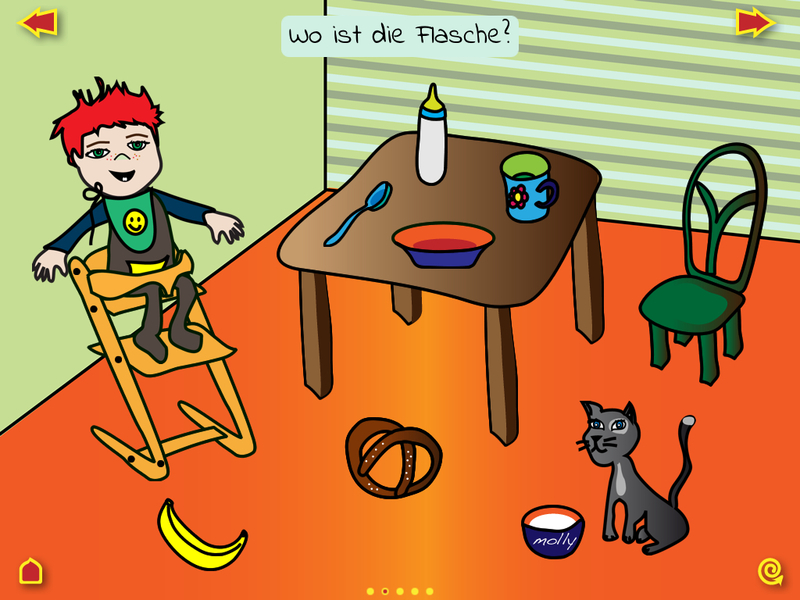 It’s much easier to learn “der Tisch” now than to go back later and try to remember whether table is masculine or feminine or neither. Overall, though, I think Baby Flash Cards packs a lot of learning into a free app, and I’m watching my kids effortlessly absorb large chunks of vocabulary — which is the goal behind any kind of language flashcard game. No matter how deftly designed, vocab drill will only get you so far. I was hoping to find an actual kids’ language program — something like Powerglide or Passport Books — but with all the kinesthetic and game-playing advantages of the iPad. So far, my explorations haven’t turned up anything specifically designed for kids, but I’ve found an all-ages program that may work for us. I’m familiar with the Living Language audio program from my own efforts, years ago, to brush up my college German after a long spell of disuse. 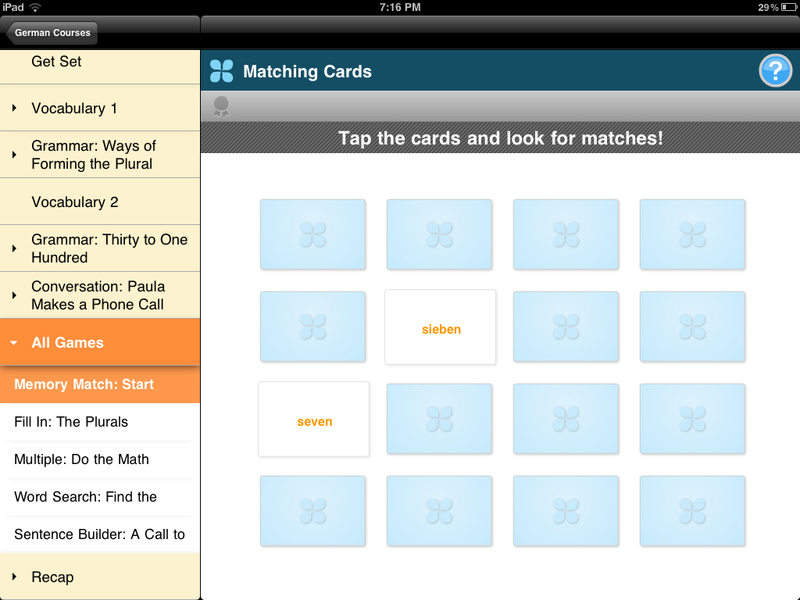 It’s an excellent format and quite engaging, so I had high hopes for the iPad version. So far, it lives up to my hopes. Put simply: My kids enjoy it and they’re learning a ton. Now, the pictures illustrating the words and phrases here are your basic corporate stock photos — not a lot of kid appeal there. But the app’s easy functionality and plentiful games have captured my kids’ interest. I’m pleased with the seamless integration of grammar and vocabulary, especially the emphasis on useful everyday phrases. 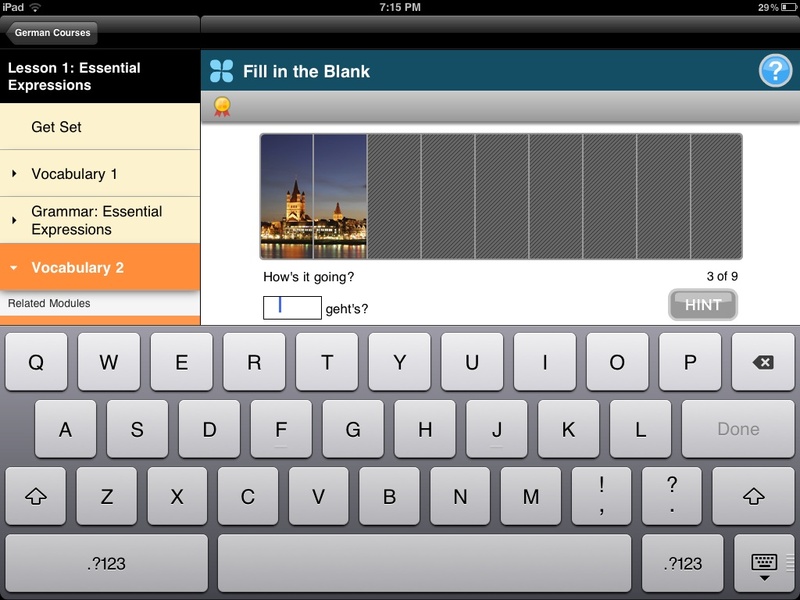 I also like that there are typing exercises that require the student to enter words manually; this is an important component of fluency, and the way it works in this app is smooth and simple. High marks there. The free version features the first three lessons in Level 1 (as well as a few lessons each in Levels 2 and 3, but those won’t do my kids much good without the rest of Level 1). The full version of the app contains 46 lessons across the three levels and costs $14.99 — which is a whole lot less than I paid for my long-lost Rosetta Stone CDs. I’m still pondering whether to commit to the $15 version. If I do, I’ll report back later on our progress.